• They explored freedom, democracy, imagination, optimism, risk, and the power that comes with self discovery. • They put things together. • They tore things apart. • They enlisted the help of buddies. • They negotiated rules and figured out work-arounds for the missing parts. • They cut their fingers, discovered how far they couldn’t jump and said “no” when prodded past their known limits. When they didn’t, they learned about consequences without any adult lectures. In the past fifty years there has been a gradual erosion of the full benefit of play. More time is spent indoors. Playgrounds are so overly engineered for “safety” that they have actually become more dangerous. Children are sheltered from appropriate risk taking. And free play, where children have full control over what they do, has slowly shifted to directed play, where adults define the parameters and rules of play. the most expensive playground equipment. Play is important. Through play, especially free play, children’s brains develop the scaffolding that future knowledge will sit upon. Imagine a library full of books but lacking shelves. That’s a not so useful kind of library. But that is a bit like the kind of child we create when we dismiss the value of play in their development. And while play is valuable at all ages, it’s critical when brains are building the first generation of dendritic connections. If we, as a community, want the very best for our children, then we could re-ask some critical questions about our assumptions relative to the value of play. We could explore new ways of building play environments. 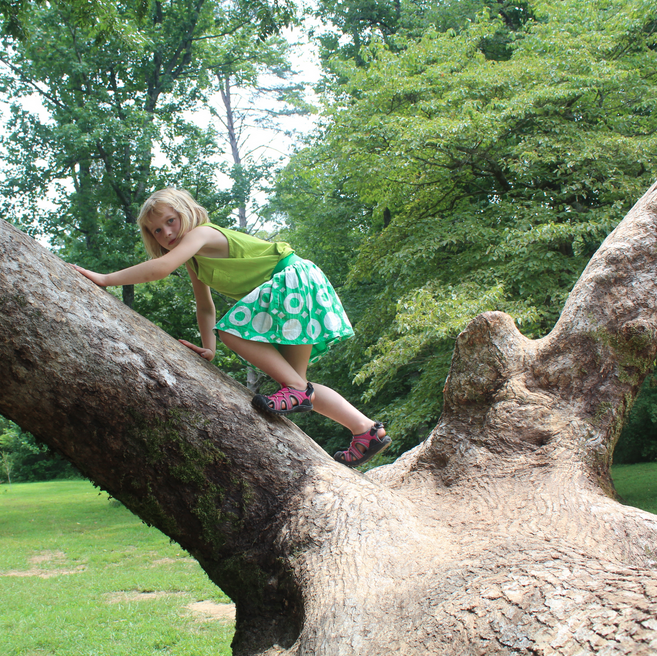 We could re-examine the role that appropriate risk-taking plays in learning. We could give children more boxes and fewer things that come in boxes. And most importantly…we could get out of the way as children play. They tend to be pretty good at it. Children are competent beings. 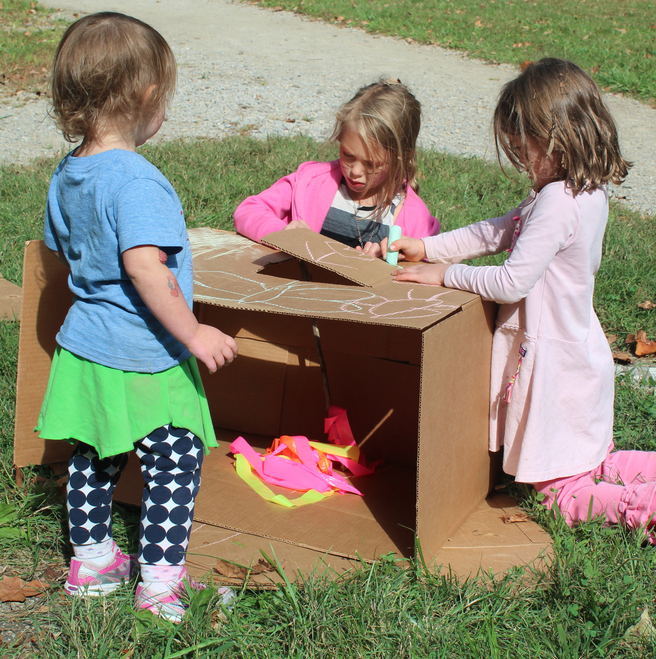 One large cardboard box is worth hours of play time. A great example of how to go about re-envisioning play environments is taking place within our community this year. 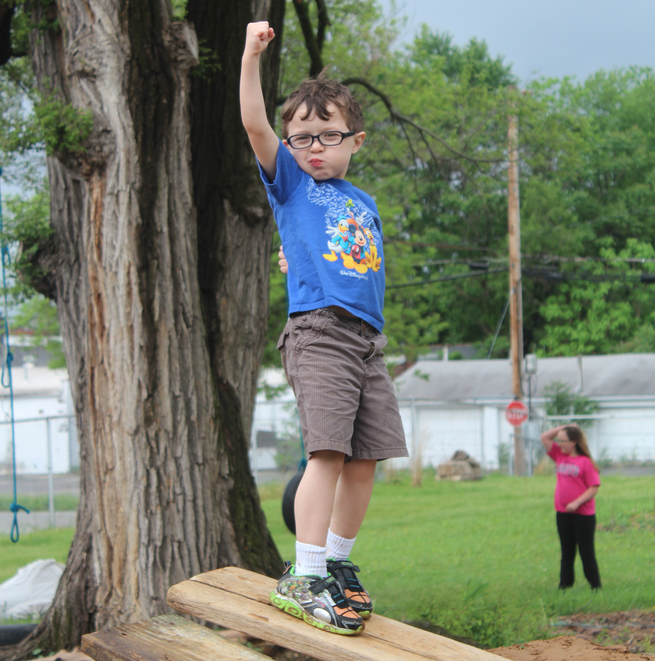 Metro United Way is partnering with Community Coordinated Child Care (4-C) to redesign two play spaces at the Excellence Academy Early Learning Centers in the west end of Louisville. Keystone Learning Academy and the Chestnut Street YMCA will soon provide children with great places to learn through play. Bernheim Arboretum and Research Forest is happy to be a small part of that effort. Those play environments will become the vanguard of a new generation of play environments that will support healthy child development. It takes a village to build a playground. You can be a part of that village. The payback for this work is huge. To get involved or learn more, email Mia Cooper with Metro United Way. Providing loose parts for play encourages children to work cooperatively. 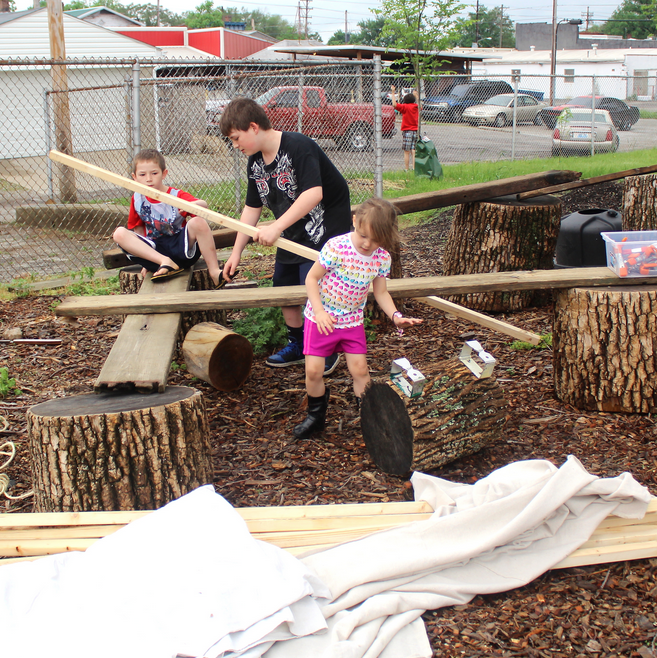 Sticks, tarps and clips create endless possibilities. Through annual conferences, mini-grants intended to spur first steps, collaborative community projects, free play activities and continued investigations into play-based theories for child development around the world, the Children at Play Initiative is beginning to nudge our regional needle toward more and better play environments that address our goals. We are excited by what is happening in our community. And more importantly, we are beginning to see how children are responding to our collective efforts. We envision a future where all children have access to outdoor play environments that foster a life-long love of the natural world. For more information contact Claude Stephens at cstephens@bernheim.org or visit the Bernheim web site at www.bernheim.org. 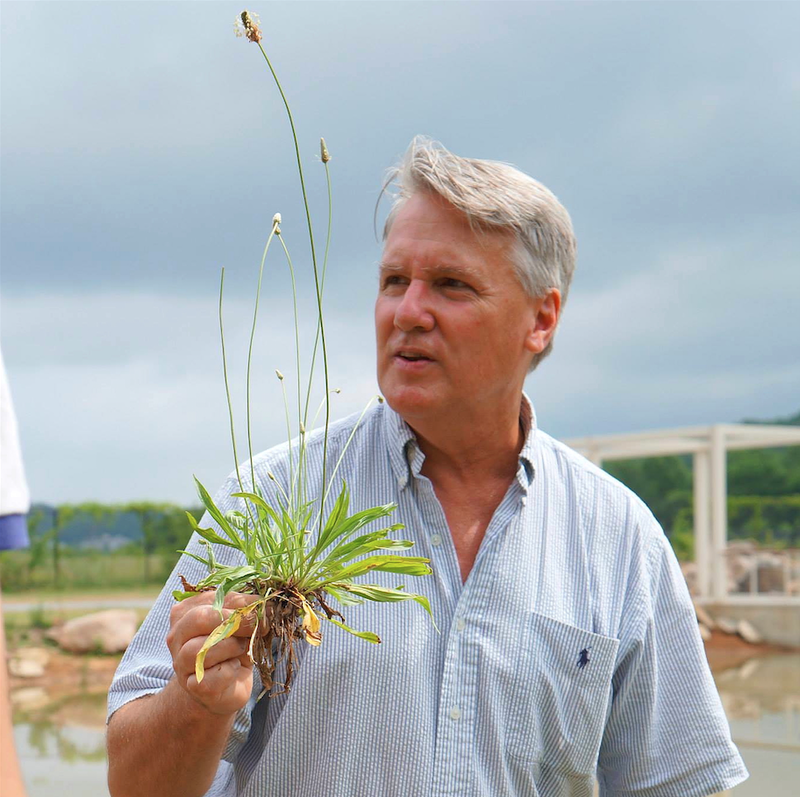 Claude Stephens is, among other things, the Facilitator of Outreach and Regenerative Design at Bernheim Arboretum and Research Forest. In that role he is the point person for Bernheim’s Children at Play Initiative which is focused on re-thinking the value of play. Claude is an ecologist, storyteller, urban homesteader, parent, and supporter of ideas and actions that make communities healthier, more creative places to dwell. You may reach Claude at cstephens@bernheim.org or visit www.bernheim.org.